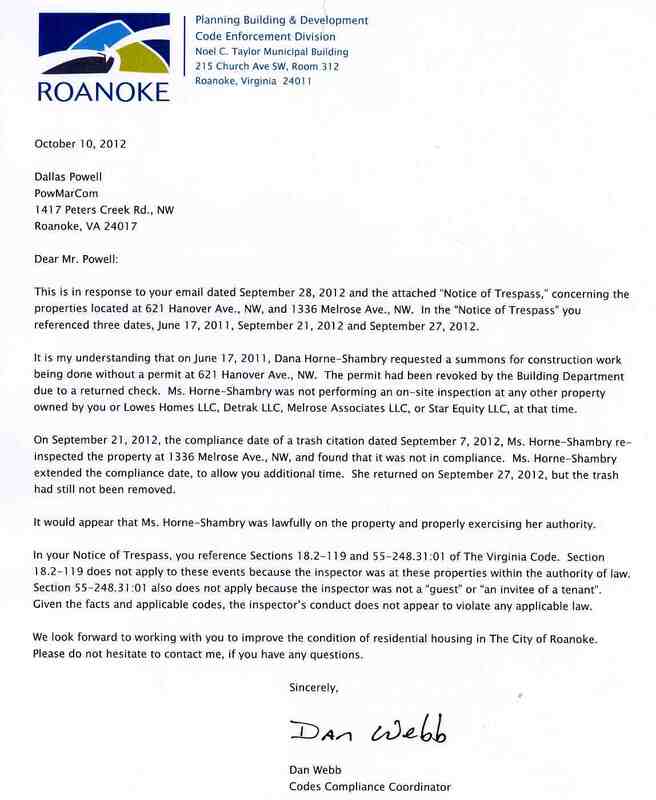 Unfortunately Dana Horne-Shambry backed me into a corner with relentless attacks that were clear violations of the law so I was forced to send her a trespassing notice. Below is the trespassing notice and the image attached you can click on which will enlarge to read. It is Dan Webb's response to this trespassing notice. Below that is my final response. All properties owned by Dallas Powell, Lowes Homes LLC, DeTrak LLC, Melrose Associates LLC and Star Equity LLC. 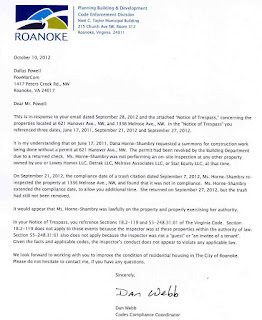 You may not trespass on any of the above listed properties without either, Dallas Powell or Larry Wilson in presence and an accompanying supervisor from Roanoke City Code Enforcement. Further, you are hereby notified that if you are found entered upon the above premises after the date of 9/28/12 without the presence of Dallas Powell or Larry Wilson and a supervisor, your presence shall be deemed a trespass upon said property herein described and the owner, or duly authorized representative shall take every measure permitted by law to prevent such trespass, which shall include arrest by a police officer. Should you enter or cross my property, I will notify the Police Department and seek a criminal complaint against you in the General District Court for trespassing and or apply with the magistrate for a warrant for trespass. ***REASON: Illegally entering the property of a rental unit with a valid rental inspection. Neighbors fence does not constitute probable cause. ____X_ _By phone or verbally. ____X___ Service by email and standard mail. This message is in response to your letter dated 10/10/12 regarding the notice of trespass that I sent Dana Horne-Shambry on 9/28/12. You are referring to the property 621 Hanover but this is not a property that I own. My complaint now, as then was about her continual involvement with 1336 Melrose Avenue, NW Roanoke. A house that has always had a valid rental certificate since I owned it. A rental certificate that Dana gave to me. She was fully aware what the inside of 1336 Melrose Apt 1 looked like. It looked the same as it always did since she gave me the rental certificate. You can read my posting here for full details of what my complaint with Dana is about. One thing that is not included is a violation she gave me behind 425 Bullitt on property I don't even own. I spent $1,000 cleaning up someone else's property and cutting their brush down so she would leave me alone even though it was not my property. You state that on September 21st 2012 there was a compliance date of a trash citation that was dated September 7th 2012. I received no trash citation. I have never had a problem getting my mail so it was clearly not sent to me. As a matter of fact, Dana clearly stated in her code violation for 1336 Melrose Apt 1 that she entered the premises due to a fence violation, a fence that I do not own. Therefore she was yet again illegally on my property according to Virginia Code 18.2-119 and Virginia Rental Inspections code 36-105.1:1 after she had already been sent a trespassing notice on 6/17/11. Dana had absolutely no probable cause to indicate that there are any code violations inside 1336 Melrose Apt 1, a unit with a valid rental certificate. Skirting around the law is not something that I have seen judges being favorable of in the past. I am not saying that I am intending on taking Dana to court at this point in time. I am just making a point that she needs to contact me or my contractor to enter my property due to her previous violations of the law. As I clearly stated on 9/28/12, Dana Horne-Shambry is not allowed access to any of my properties without the presence of me, my contractor Larry Wilson and one of her supervisors. A simple phone call is all that is needed. My properties are on the bar program with the city. I'm sorry but I have no other option than to protect myself from Dana.